The Sony-sponsored BLPA competition has become a staple event on the calendar of dedicated photographers living in Britain. Very few contests offer the range of specific categories to accurately depict the stories of people from all walks of British life, making BLPA a unique opportunity. The overall winner has been revealed to be Amy Bateman, who surpassed many entries with her image showing lambing season in Cumbria. Amy is from a rural background, so is an expert when it comes to country living and the vital processes such as that explored in her winning entry. Commenting on her success Amy says “I am absolutely thrilled to have won this competition, it’s an incredible honour knowing the strength of photographic passion and talent in our country. I am particularly heartened to have won with a picture portraying rural life. This is my life, and my passion. “Being a photographer living on a farm I am witness to light, conditions and images that bring so much pleasure to my life and I am overjoyed they do the same for others. "This is a self-portrait. At lambing time we occasionally get lambs that are poorly or need human support to survive. 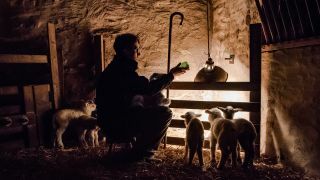 The light from the heat lamp casts a gentle glow over my small flock, the rustle of straw as the healthier lambs gambol around and the smell of the milk substitute being fed by hand provides an all-consuming experience which I was keen to portray in a picture. Using a tripod and timer I set about on my mission during the last feed of the day before bed, the lambs thankfully, were more interested in being fed than my camera." For her work Amy wins £7000 worth of Sony equipment, including an X9 65inch television, Sony A7R II mirrorless camera and Zeiss FE 24-70mm professional standard lens. Now that the main and category winners have been unveiled, a travelling exhibition will commence starting in Mall Galleries, London on 18th February and passing through Oxfordshire, Somerset and North Yorkshire. Visit blpawards.org for more information. Read more: Digital Camera Photographer of the Year 2019 Competition now open for entries!